It’s during these times, when life is stressful, a plateful of commitments and obligations that you must seize opportunities as they arise. Was it worth it? Oh yes! What I am about to tell you is a little surreal on several accounts. Some of it is top secret for now. The Brizo line was launched in April 2004, a fashion forward line manufactured by Delta. Having sold plumbing fixtures in the past for a retail showroom, I can tell you first hand that it’s bath fixtures were an instant hit with the retail public, especially female consumers. I made a mental note of that years back wondering why women stood in front of the Brizo displays longer than then the men; never dreaming that one day I would get an opportunity to meet the talented designers at Brizo. Hearing Judd Lord, Brizo’s Director of Industrial Design, speak about his travels around the world, seeking out new inspriation for the Brizo line, I understood these are creative people who are intent that their product designs will not be the same as everyone else. The message is clear: this is a fashion forward faucet line that understands that people buy products for the home as an outgrowth of their personality. The design nuances of the Brizo line is now evident to me. It’s also why I noticed why more women lingered over a striking Brizo faucet on display in a retail plumbing showroom. They are envisioning using the fixture in their own home. Brizo’s emotional intent for the consumer is to take us to another dream state…that of envisioning a new kitchen or bath room. 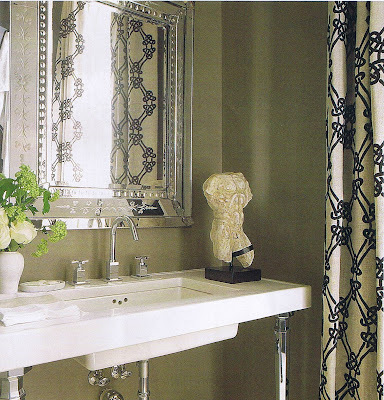 This Oscar worthy faucet has Hollywood Glamour written all over it. The name Brizo is inspired by Greek mythology. 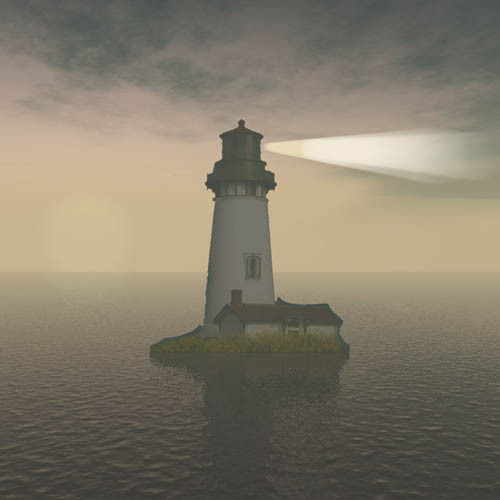 Brizo (Greek: Βριζώ; derived from ancient Greek word βρίζω meaning “to slumber”) is an ancient Greek goddess who was known as the protector of mariners, sailors, and fishermen. She was worshipped primarily by the women of Delos, who set out food offerings in small boats. Brizo was also known as a prophet specializing in the interpretation of dreams. Source: Wikipedia. New York City: Meeting the Designers in Fashion Mecca: New York City. Somebody pinch me! I was thrilled to meet up with other kitchen and bath designers across the country, who’s blogs I have been following regularly for the past few years. Here is the list courtesy of Paul Anater’s site, Kitchen and Residential Design. Blogging has become a new phenomena for designers, a platform to share information with clients and readers as well as sound off about what we see, want and need in our design world. Or simply to share random thoughts and rants alike. It’s because of our blogging that we were tapped to come meet the designers at Brizo and give our feedback on the new products in development. While I can’t tell you what is coming, [shh, top secret], you will just have to watch for updates in Spring, I can tell you that getting to meet with Brizo’s Product Development team, Brian Nobbe, Judd Lord, Seth Fritz and all the fine people from Brizo and MS & L was a surreal experience. Suffice it to say, the Brizo design team knows how to make designers perk up and engineers cry. There I sat in a product preview think tank, elbow to elbow with some rock star Kitchen and Bath designers in their own right, and I just had to stop and think “Am I dreaming?” Brizo wants to know what I think of their new products. (In my head, I was thinking…”You’ve come a long way, baby”), from my past experience spec’ing out the product with customers in my showroom to being flown to New York for a Product Training Session with fellow Kitchen and Bath Designers that I admire was nothing short of surreal. Where Faucets meet Fashion. Meeting Jason Wu. The highlight of the trip was getting to attend a New York Fashion Show. Just as Brizo is a fresh new face on the luxe faucet scene, up and coming Fashion Designer, Jason Wu, made a splash on the fashion front as First Lady Michelle Obama’s inaugural gown designer. Known for his ethereal-like ball gowns, it was logical for Brizo to sponsor Jason Wu during Fashion Week. Brizo and Jason Wu are two brands with a similar design aesthetic. What we see on the runway first filters down to home interiors in color, pattern & style lines. Imagine for a moment that you are a product designer for Brizo. The challenge is coming up with new and inspiring designs for consumers that are functional, built with cutting edge technology, and different looking than anything else on the market. Not to mention convincing the engineering department that the new concepts are relevant and not gimmicks. Having won the prestigious Adex Award for four collections, The Red Dot Award, The Graphis Award, House Beautiful KBIS Award, Brizo has consistently proven they are a formidable force on the luxury faucet market. Design Inspiration is all around us. The design team at Brizo has the good fortune of being able to travel the world and translate their design ideas into faucets that you would want to have in your kitchen and bath. Here is a small sampling of where Brizo designers find their inspiration. Baliza effortlessly combines the timeless and the modern. Wrapped around its classical form is cutting-edge innovation, including a four-function pull-out wand that attaches with new MagneDock® Technology. Baliza is the first pull-out or pull-down kitchen faucet to allow water volume to be controlled from the wand. MagneDock Technology®, and Brizo’s exclusive SmartTouch Technology®, which allows water activation with just a light touch. …and from ideas inspired by colors and shapes found in fashion. Ideas can start from a quick jot of an idea on the back of a cocktail napkin, as is the case of the Venuto Collection (shown below) which was inspired by hair pins worn by Japanese woman. Read the story told by Judd Lord at Kitchen and Residential Design. The trip was a dream, Brizo style! I came, I was inspired, and grateful for the experience to bring back and share my experience with you. Look for new product releases from Brizo in spring. The ethereal dream like photography images from Brizo’s ad campaigns are the work of photographer Howard Schatz. It was interesting to know these images were created underwater. How perfect is that? Check out this video below to see how they did it. *Brizo compensated me for travel and accommodations. Teo Jasmin: for the largest choice of canvas prints and decorative cushions. When your design calls for a bold splash of color or eclectic whimsy start your search with Teo Jasmin. This next photo caught my eye, (enlarge the magnified image below). Using alternative methods: canvas print sandwiched between glass will make a bold and “splashy”statement to your otherwise plain backsplash. The kitchen backsplash shown below becomes a space for artwork. (although this photo looks to be just canvas-which I do not recommend for practical reasons). GFI Outlet locations can be cut into the glass or opt for a plug mold power strip located under cabinet can be used instead for an uninterrupted appearance. (Check your local code requirements first). I love glass backsplashes. For more information on the canvas prints, contact TEO JASMIN. Last week we toured Moby’s compact kitchen and discovered his favorite appliance: the microwave. A kitchen space that works well for a musician who spends most of his life traveling. This week we take a tour to Colin Cowie’s kitchen through the web link at Epicurious. http://video.epicurious.com. Colin’s kitchen is the epitome of a well defined kitchen space, perfect for entertaining. Notice the grey stained oak cabinets. Very sophisticated. Enjoy the tour. For more tours visit http://www.Epicurious.com or click on the side bar link. 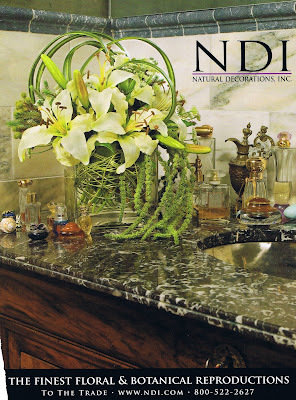 Imparting sexiness, glamor and oh so sophisticated; watch for the newest shades in decorative fixtures, stone and paint. In a sea of chrome and oil rubbed bronze, grays and blacks are making their way to the center stage. Also for the floor, look at Galaxy Black stone from Ann Sacks. It comes in three finishes: Honed, Antiqued, and Bush-Hammered. With sealer, it simply glows as a surface. 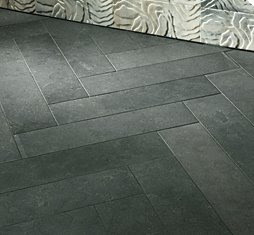 Galaxy Black by Ann Sacks, brings a rustic yet sophisticated black limestone to our stone assortment. Reminiscent of a starry sky on a dark night, the character and patterning of this material has inspired its name. Offered in a variety of finishes, this material is uniquely flexible. black marble and gray veined tiled walls. Renea Abbott’s home in Houston is filled with uber drama details in nuetral shades of gray and muslin. I was searching in the November-December issue of Veranda for a picture of her kitchen with calcutta gold marble tops with the wall cabinets removed, bit no such luck. Instead, above is a sneak peek of the powder room. Walls painted in a soothing nuetral gray. featuring marble stairs and hand-carved ballustrades. The Los Angeles Times, Sunday Home & Garden section announces the opening of the Veranda sponsored Greystone show house 2008. As an undergraduate at UCLA, I would steal away time between morning and afternoon classes, drive up the curvy streets in Beverly Hills to have a quiet moment in the gardens, study and daydream about the history of the Doheny Mansion. It was there, I would pullout my sketch book and study the architecture and dream about a career in design. Visitors are invited to stroll through two public areas on the grounds—the beautifully maintained formal gardens with their centerpiece fountain, and the pool and inner courtyard area. PHOTOS FROM THE LA TIMES. For more photos visit: Greystone show house 2008.
fill the family kitchen by Veranda. Detail of the carved hood. Pictures from past events at Greystone. Notice the kitchen transformed from a past Design House. The lights and wall cabinets are original to the home. It appears the floor, paint, island, appliances and base cabinets have been changed from each Design House. During my college years, the reflecting pond was one of my favorite areas to sit, although not as lusciously appointed as shown in this photo. Peel me a grape! For a history of Greystone please visit Friends of Greystone Mansion. The Beverly Hills house will be open through Nov. 16, and admission is $30. For more photos click in the above link to the LA Times.